Jerusalem is one of the oldest cities on the planet. 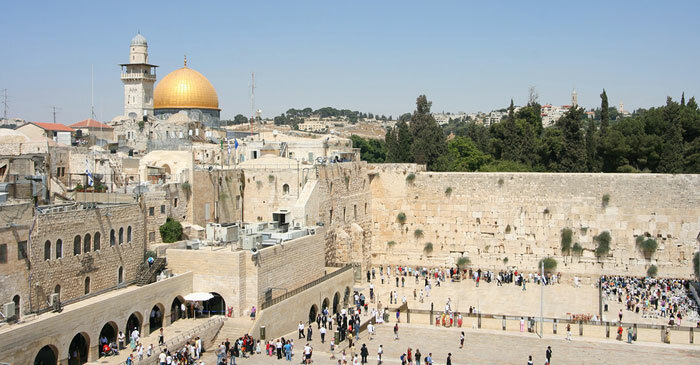 It is of massive spiritual significance to three of the worlds biggest religions - Judaism, Christianity and Islam - and consequently has endured a war-torn history, with Israel and Palestine both claiming it as their capital. According to the Old Testament, King David created Jerusalem as the capital of the Kingdom of Israel and his son King Solomon commissioned the first temple. The New Testament made the city the location of the crucifixion of Jesus, and according to the Quran Muhammad made his night journey to Jerusalem where he ascended to heaven and spoke to God. Fly to Tel Aviv. Check the latest travel advice from the FCO. Set on the western bank of the holy river Ganges, Kashi Vishwanath is one of the most famous Hindu temples. It is a jyotirlinga shrine, dedicated to Lord Shiva who is believed to have appeared here as a fiery column of light. Hindu people are expected to make a pilgrimage here at least once in their lifetime. Fly to Delhi and on to Babatpur airport. Image by bvi4092 under Creative Commons license. Lourdes is a small market town in the Midi-Pyrenees region of south-western France. It gained fame amongst Catholics in 1858 when the Virgin Mary is believed to have appeared 18 times to a local 14-year-old girl, Bernadette Soubirous. Since then Lourdes has become a place of pilgrimage, with more than 200 million visitors since 1860, many of them hoping to be healed by spring water from the grotto. The original temple of Mahabodhi in Bodh Gaya, Bihar was completed in the 7th Century to commemorate the site of Prince Siddhartha Gautamas supreme enlightenment and the moment he became the Buddha. It is the most sacred place of pilgrimage for Buddhists in the world. Fly to Delhi and on to Gaya airport. As the birthplace of the Prophet Muhammad and the religion he founded, Mecca is the centre of the Islamic world. Positioned in the Sirat Mountains of Saudi Arabia and 45 miles inland from the coast, Mecca is an oasis in the sacred region known as the Hijaz or Hejaz. The Kaaba is here, a cuboid building within Islams most sacred mosque Al-Masjid al-Haram, which all Muslims are expected to face when praying. Non-Muslims are not permitted to enter the city. More than a couple of big red rocks, Uluru and Kata Tjuta in the Central Australian desert are millions of years old and have been home to the Yankunytjatjara and Pitjantjatjara Aboriginal people for tens of thousands of years. They believe that the land was made by creation ancestors who have left behind marks in the earth and a spiritual law to guide their lives and the relationships between people, animals and the land. Fly to any major Australian airport and on to Alice Springs. Image by eviljohnius under Creative Commons license. Once again of seminal importance to the Jewish, Christian and Islamic faiths, Mount Sinai or Mount Horeb in Egypt is thought by many to be where Moses received the Ten Commandments from God. Saints, prophets, pilgrims and tourists have been travelling here for thousands of years. Fly to Taba or Sharm el-Sheikh airports. Check the latest travel advice from the FCO. Have you ever made it to any of these places? If you enjoyed this post like us on Facebook and follow us on Twitter or Google+.